"He throws his whole soul into his work, questing carefully over the cold scent, feathering eagerly when the bird is close, and at last drawing up like a statue." The sheep-dog and the cattle-dog are the workmen of the animal kingdom; sporting and fighting dogs are the professionals and artists. A house-dog or a working-dog will only work for his master; a professional or artistic dog will work for anybody, so long as he is treated like an artist. A man going away for a week's shooting can borrow a dog, and the dog will work for him loyally, just as a good musician will do his best, though the conductor is strange to him, and the other members of the band are not up to the mark. The musician's art is sacred to him, and that is the case with the dog -- Art before everything. It is a grand sight to see a really good setter or pointer working up to a bird, occasionally glancing over his shoulder to see if the man with the gun has not lost himself. He throws his whole soul into his work, questing carefully over the cold scent, feathering eagerly when the bird is close, and at last drawing up like a statue. Not Paganini himself ever lost himself in his art more thoroughly than does humble Spot or Ponto. It is not amusement and not a mere duty to him; it is a sacred gift, which he is bound to exercise. A pointer in need of amusement will play with another dog -- the pair pretending to fight, and so on, but when there is work to be done, the dog is lost in the artist. How crestfallen he looks if by any chance he blunders on to a bird without pointing it! A fiddler who has played a wrong note in a solo is the only creature who can look quite so discomfited. Humanity, instead of going to the ant for wisdom, should certainly go to the dog. 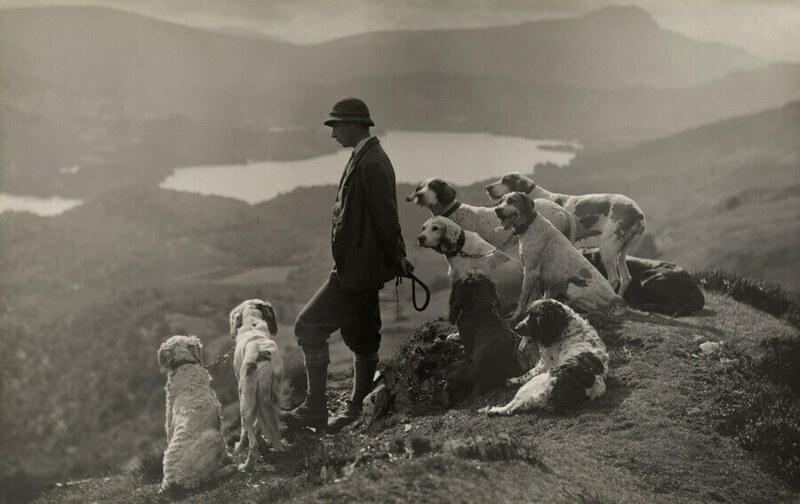 Sporting dogs are like other artists, in that they are apt to get careless of everything except their vocation. They are similarly quite unreliable in their affections. They are not good watch dogs, and take little interest in chasing cats. They look on a little dog that catches rats much as a great musician looks on a cricketer -- it's clever, but it isn't Art. Hunting and fighting dogs are the gladiators of the animal world. A fox-hound or a kangaroo-dog is always of the same opinion as Mr. Jorrocks: -- "All time is wasted what isn't spent in 'untin'." A greyhound will start out in the morning with three lame legs, but as soon as he sees a hare start he MUST go. He utterly forgets his sorrows in the excitement, just as a rowing-man, all over boils and blisters, will pull a desperate race without feeling any pain. Such dogs are not easily excited by anything but a chase, and a burglar might come and rob the house and murder the inmates without arousing any excitement among them. Guarding a house is "not their pidgin" as the Chinese say. That is one great reason for the success of the dog at whatever branch of his tribe's work he goes in for -- he is so thorough. Dogs who are forced to combine half-a-dozen professions never make a success at anything. One dog one billet is their motto. The most earnest and thorough of all the dog tribe is the fighting dog. His intense self-respect, his horror of brawling, his cool determination, make him a pattern to humanity. The bull-dog or bull-terrier is generally the most friendly and best-tempered dog in the world; but when he is put down in the ring he fights till he drops, in grim silence, though his feet are bitten through and through, his ears are in rags, and his neck a hideous mass of wounds. In a well-conducted dog-fight each dog in turn has to attack the other dog, and one can see fierce earnestness blazing in the eye of the attacker as he hurls himself on the foe. What makes him fight like that? It is not bloodthirstiness, because they are neither savage nor quarrelsome dogs: a bulldog will go all his life without a fight, unless put into a ring. It is simply their strong self-respect and stubborn pride which will not let them give in. The greyhound snaps at his opponent and then runs for his life, but the fighting dog stands to it till death. Just occasionally one sees the same type of human being -- some quiet-spoken, good-tempered man who has taken up glove-fighting for a living, and who, perhaps, gets pitted against a man a shade better than himself. After a few rounds he knows he is overmatched, but there is something at the back of his brain that will not let him cave in. Round after round he stands punishment, and round after round he grimly comes up, till, possibly, his opponent loses heart, or a fluky hit turns the scale in his favour. These men are to be found in every class of life. Many of the gamest of the game are mere gutter-bred boys who will continue to fight long after they have endured enough punishment to entitle them to quit. You can see in their eyes the same hard glitter that shows in the bulldog's eyes as he limps across the ring, or in the eye of the racehorse as he lies down to it when his opponent is outpacing him. It is grit, pluck, vim, nerve force; call it what you like, and there is no created thing that has more of it than the dog. The blood-lust is a dog-phase that has never been quite understood. Every station-owner knows that sometimes the house-dogs are liable to take a sudden fit of sheep-killing. Any kind of dog will do it, from the collie downward. Sometimes dogs from different homesteads meet in the paddocks, having apparently arranged the whole affair beforehand. They are very artful about it, too. They lie round the house till dark, and then slink off and have a wild night's blood-spree, running down the wretched sheep and tearing their throats open; before dawn they slink back again and lie around the house as before. Many and many a sheep-owner has gone out with a gun and shot his neighbour's dogs for killing sheep which his own wicked, innocent-looking dogs had slain. Add The Dog -- as a Sportsman to your own personal library.